If you love a product with a story as much as I do, then this Made-4-Baby Belly Oil For Pregnancy Stretch Marks review should really turn you on! First of all the company is great, they work in association with women’s cooperatives in support of the rights of the workers who supply the natural ingredients they use. Secondly the product is fantastic, with only the most natural organic goodies included. This oil aims at repairing and preventing stretch marks by giving a healthy dose of vitamins and oils to your skin to promote natural cell regeneration, helping your body to protect itself. So marvellous! It’s just so rare to see such a short list of ingredients, and with so few synthetic constituents with numbers in their names! 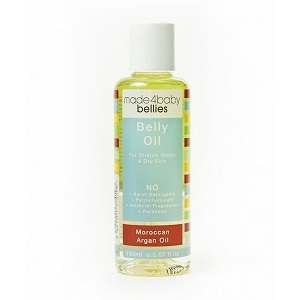 Just four essential oils goes into this fantastic belly oil. You’ll find that this also means that you carry about the most fantastic, calming fragrance with you all day. Dosage really doesn’t apply here, all of the ingredients are naturally goodies, and the oil is developed for use during pregnancy (though it works well all year round). If you are using a stretch mark product with a strict dose, then do make sure to check that it is safe during pregnancy. Unless you have a very particular allergy to one of these four ingredients, then there is nothing to worry about regarding side-effects when using the Made-4-Baby stretch mark belly oil. The price is, in my humble opinion, an absolute steal! Advertised for $25 on their site, the product really does exceed expectations. The price tag on products with such premium natural ingredients; from such concerned philanthropic companies; with such charming design and packaging; is generally through the roof. The price is one of the most eye-catching features of this stretch mark product, a truly modest price for a product you would expect from top of the range options. Unfortunately no warranty or guarantee is offered by Made4Baby on any product, including the Pregnancy Stretch Mark Oil. However the product doesn’t carry the price tag of those which usually do offer one. Also I should add, the product really is a ‘what you see is what you get’ deal. No nasties, and no pollutants, ethically sourced, with only the finest natural plant oils. No stretch mark product can guarantee success for preventing or repairing all stretch marks, some people suffer more severely than others. If you believe that a natural remedy is your most healthy and best chance though, this pregnancy belly oil gets the thumbs up, guaranteed! The biggest pros of the made-4-baby oil have to be the minimalist ingredients list, and the really great price which is half of what you might pay elsewhere. On the down side none of the ingredients pack a particularly powerful punch as all of the ingredients are simply essential oils. Whether or not this type of product has much potential with severe stretch mark healing is quite uncertain. And yet again we have a product which is without any type of guarantee to protect your purchase. David Carney	reviewed Made-4-Baby Belly Oil	on July 12th	 and gave it a rating of 2.5.